After receiving plenty of requests for a physical version of the book, maps, Czech language cheat sheet, restaurants and walking tour recommendations etc. the Prague Local Explore Kit Bag was created. The bag full of local exploring goodies will be hand delivered to your hotel so that as soon as you arrive (or within 24 hours if you are already here) you will be ready to start exploring Prague like a local. 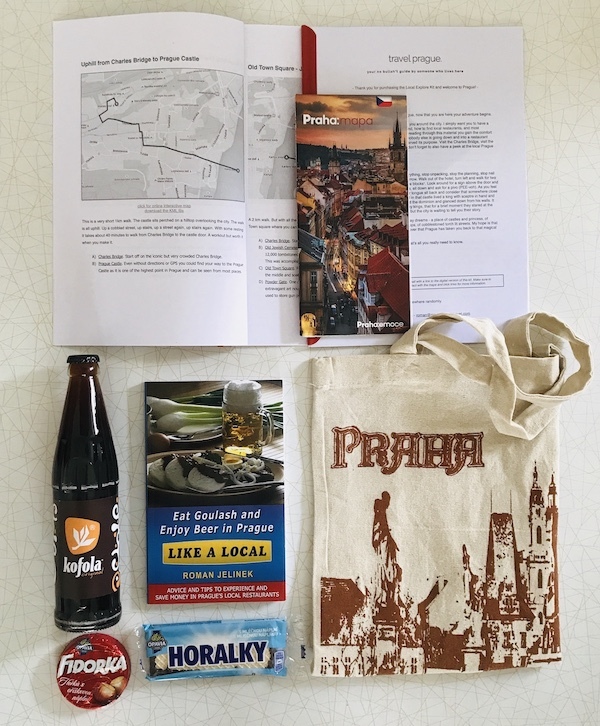 The Prague Local Explore Kit Bag ensures that you have everything you need to explore the local Prague. The information, the references, the Czech words, the courage and the energy to comfortably and confidently stroll down a lonely cobbled stone street and into a restaurant bustling with locals. By being local not only will you experience the real Prague, you will also avoid tourist traps and save your money for abundantly more goulash and world famous Czech beer. Simply by using the resources included and avoiding 2 tourist trap meals this Kit pays for itself. Paperback book signed by the author (me) Eat Goulash and Enjoy Beer in Prague Like a Local *same paperback version as sold on Amazon (a ~$14 value) Reading this will make you feel and act like a local. Portable Prague Tourist Map where all the interesting places are and how to get there. 20 Pages of My Personalized Suggestions when friends visit this is where I tell to go eat and what to see. Prague Walking Tours Guides/Maps Prague is small enough to be able to see most of it with your legs. These maps will fill your head with ideas on how to keep your feet busy for days. Includes all the must see sites. Printed list of my favourite local restaurants. What they serve, why you should go there, and a map of where they are. Prague Public Transport Ticket zone 3 ticket. Will get you almost everywhere in inner Prague on the metro, tram and bus. Valid for 60 minutes or 3 zones (almost all of inner Prague). Common Czech phrases cheat sheet - A front and back back pocket foldable sheet with common Czech words and phrases. Enter Czech speaking only establishments with the words you need to get what you want. Detailed Day Trip to Small Town Outside of Prague - Short train ride to small Czech villiage just outside of Prague. See locals going about their normal day - without the tourists. Printed Food Allergies Warning Card - A card written in the Czech language which you can give to waiters at local resturaunts so that they are aware of your allergies. Traditional Czech Chocolate Snacks: Popular during the communist times and only available in Czech. *for energy. A Surprise. *hint: it is made in the Czech Republic and the locals love it. Delivered in a quality cloth tote bag *(similair bag as trusted by the grandmothers army). Complete access to the Prague Local Explore Kit - DIGITAL Version. Basically it is all the information in a digital format so that you can download and view it on you computer or mobile device. This will be emailed to you right after you complete your purchase so you will be able to start reading and using the maps immediately. It is included free with this kit. See below for more information about what the digital version includes. Also, if you purchase this Kit I will be available throughout your trip via email to answer any questions you might have about traveling Prague. Fill out the form below. Include a hotel name/address to pick your bag up at the reception desk. Pay $29 $25 usd (summer sale) via PayPal. If for whatever reason you are not satified I will honor all requests for refunds with no questions asked. You can request a refund either by contacting me or directly from PayPal. Click the button below to make your Paypal payment (if you do not have Paypal account you will have option to pay via credit card). You will receive an email confirming your order. Your Prague Local Survival Kit Bag will be waiting for you at your hotel reception desk within 24 hours on your delivery date. The digital version has all the helpful information of the Prague Local Explore Kit Bag but in digital form. So you can view all the maps, guides and tips on your computer and mobile device. You will receive and email with access to all the digital content immediatly after your purchase. The complete Eat Goulash and Enjoy Beer in Prague Like a Local ebook in PDF format. Prague Walking Tours Maps. Five interactive maps with walking tours in Prague including commentary and links to points of interest. The walks cover most of the interesting sites in Prague. And because they are Google Maps you can view the maps in your mobile divice and be navigated to each of the walking waypoints (just like driving navigation). Also included are KML files which you can download to your GPS device or your own digital map. You can view the maps online or download the PDF. My favourite local restaurants recommendations. An interactive map with markers showing where the resturants are, their website links, phone numbers and customer reviews page. You can view maps online or download the PDF. Common Czech phrases cheat sheet. A 2 page printable PDF with common Czech words you might want to know as you walk around Prague. Detailed Day Trip to Small Town Outside of Prague. An interactive map with markers and tips describing everything you need to know to make a day trip to small town Čelákovice - what train you need to get on, where to get off, what to see and a walking tour map you can download to your mobile device (KML file also included). You can view the maps online or download the PDF. Click the button below to make your Paypal payment (if you do not have Paypal account you will have option to pay via credit card). After successful payment you will receive an email (to your PayPal email address) confirming your order. Your access to the Prague Local Survival Kit DIGITAL VERSION will be sent to your email immediatly. If for whatever reason you are not satified I will honor all requests for refunds with no questions asked. You can request a refund either by contacting me or directly from PayPal.